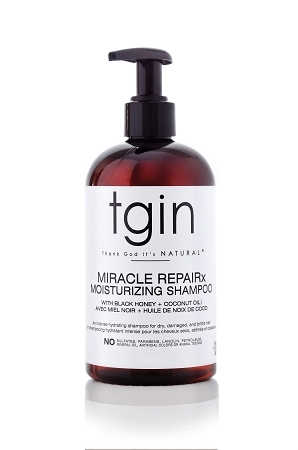 Formulated with rich black honey and hydrating coconut oil, Miracle RepaiRx Moisturizing Shampoo gently cleanses hair without harsh sulfates. Coconut oil smoothes the cuticle surface, leaving hair feeling soft and smooth while black honey heals damage, leaving behind shiny, bouncy curls. Free from parabens, sulfates, petrolatum, lanolin, artificial colors, or animal testing. Directions: Wet hair thoroughly. Apply a liberal amount of Miracle RepaiRx Moisturizing Shampoo to your palms. Distribute evenly throughout hair and scalp. Rinse well. Shampoo a second time if needed to remove excess buildup. Follow with Miracle RepaiRx Revitalizing Conditioner or for extra deep conditioning, Miracle RepaiRx Deep Hydrating Hair Masque. INGREDIENTS: AQUA (PURIFIED WATER), RAW BLACK HONEY, COCOS NUCIFERA (COCONUT) OIL, AGAVE AMERICANA LEAF (AGAVE) EXTRACT, CARICA PAPAYA FRUIT (PAPAYA) EXTRACT, GINGER ROOT (GINGER) EXTRACT, GARDENIA TAHITENSIS (MONOI) FLOWER EXTRACT, EUTERPE OLERACEA (ACAI) FRUIT EXTRACT, SCLEROCARYA BIRREA (MARULA) SEED OIL, PHYLLANTHUS EMBLICA FRUIT (AMLA) EXTRACT, VACCINIUM MYRTILLUS (BILBERRY) EXTRACT, SACCHARUM OFFICINARUM (SUGAR CANE) EXTRACT, ACER SACCHARUM (SUGAR MAPLE) EXTRACT, CITRUS AURANTIUM DULCIS(ORANGE) FRUIT EXTRACT, AND CITRUS MEDICA LIMONUM (LEMON) FRUIT, DISODIUM COCOAMPHODIPROPIONATE, SODIUM C14-16 OLEFIN SULFONATE, POLYSORBATE 20, COCAMIDOPROPYL BETAINE (DERIVED FROM COCONUT), SODIUM COCOYL ISETHIONATE, DECYL GLUCOSIDE, POLYQUATERNIUM-10, CITRIC ACID, PHENOXYETHANOL, FRAGRANCE, CAPRYLYL GLYCOL, EDTA DISODIUM, PANTHENOL (PRO VITAMIN B5), TOCOPHERYL ACETATE (VITAMIN E). I’m so use to using shampoos that dry out my hair and leaving it feeling lifeless. This shampoo actually cleansed my hair and it felt moisturized before I even added the conditioner! I am in love with this shampoo. I am in love with this shampoo. I’ve used it three times so far and my hair feels so silky each time. Well be purchasing in the future. I used this on my daughters hair after taking her braids down and it cleansed it really good with no knots or over drying. Well be purchasing in the future. I didn’t think I could love a shampoo more than your original one but this one takes the cake. My hair felt so clean after and it smells amazing.